and any scan tool to see if the CMP sensor is dead. and even u-joints and CV joints, do not be afraid to make things, on the 1999 up car, the CMP sensor same deal, mark it, at the base. Yes I’m only a pup, this is my first vehicle with a distributor the rest has coil packs. Those you can slap on... this not so much. So I have a little bit of am issue but it's probably me overthinking it. If I mark the #1 plugwire, my mark won't be in the same place as the pic you posted. That would be number 2. I have TDC on firing #1 but I don't want to try crank it until I have it 100% so I don't loose it. But in this pic I have my finger on #1 spark wire. So do I put the rotor on #1 spark wire at TDC of how you have it in the pic? installing new distrib is last steps not the first. sorry. now the spark hole can not be blown, with rubber hose to lips. now and only now can the distributor be installed. you can not skip steps, here, the cam turns 1/2 the speed of the crank. the cylinders fire, 1,3,4,2 . all dictated by the cam. now with the cap installed in the distrib in your hand. if you look here, see that location? i call it 1pm from the main mount, see that. mark put tape on that wire lug, mark tape as #1 per the drawing here. next take off the cap. leave it off. see that mark you made on the rim, that is #1 firing rotor position there. now drop the distributor so that 13 teeth align in the dissy hole. drop it over and over to get the rotor pointer, to #1 mark you just made. and at the same time get the base clamp hole threads seen there, bolt out, in the window of the base arc slot. mount. then insert the mount bolt and tighten it. about center of said slot arc. there is no other way. sorry. all marks are cut for #1 firing only. so there are no other ways. but is not right, doing that, only the drawing is correct. 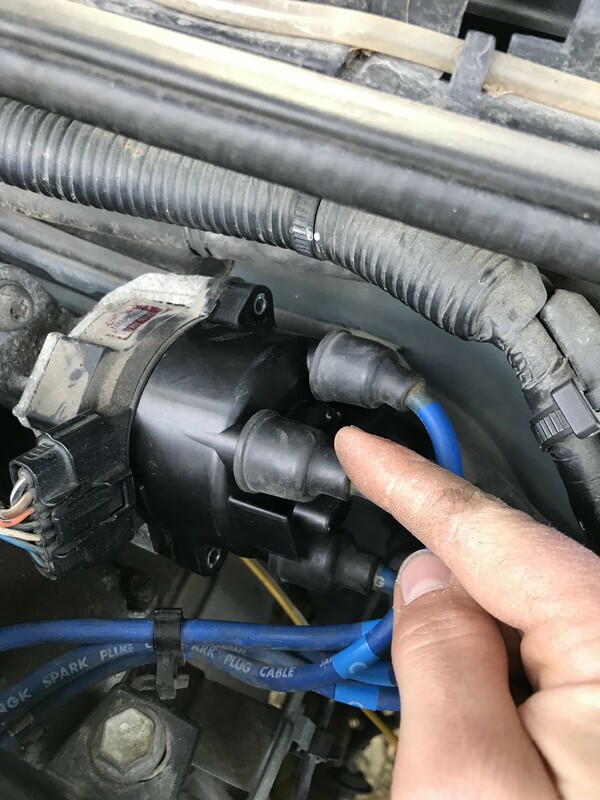 and lets the harness reach to the connector on the side correctly so only install it like the drawing shows. lay the wires as see above. you cant get the mount wrong, as its fixed. only the rotor and gear timed wrong. be sure the rotor is not installed wrong, 1 of 3 ways, one fits only, if not the rotor is crap. 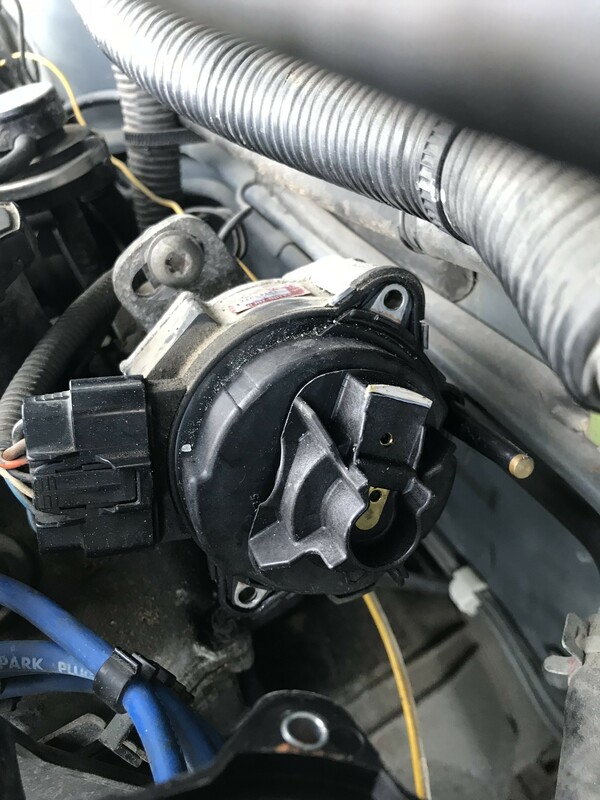 (the rotor as spring clip on the bottom prevention backwards installations,, some china crap rotor fit on 3 ways, and are a horror, 3 x13 teeth way to get it wrong. yes a horror. the bosch rotors fit like glove, as do NGK or other top grands. Ok, I'll follow these steps tomorrow. 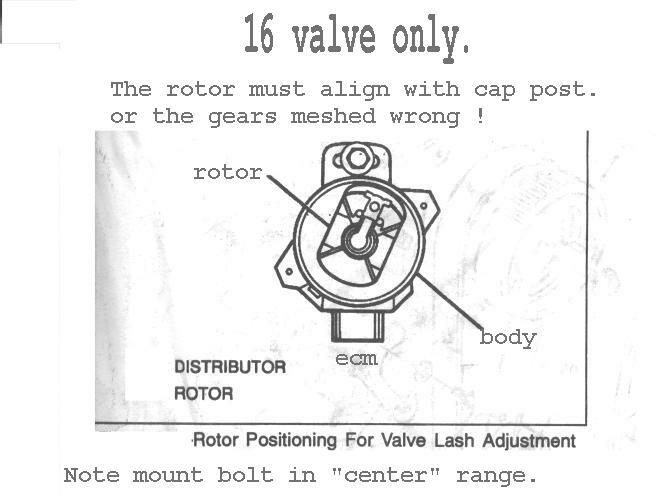 It's just messing me up that my #1 wire isn't in the same place as your 16 valve drawing and photo. 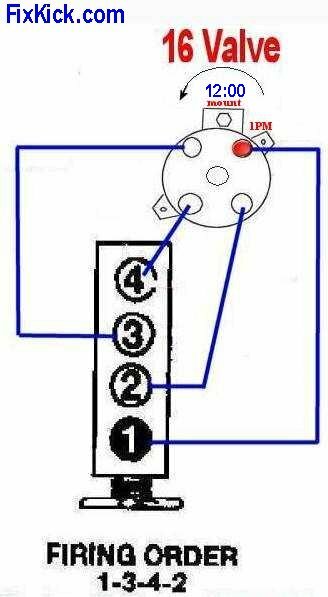 My #1 wire is at 11 o'clock (where #3 is in your drawing) if the mount is 12 o'clock. Anyway, i'm probably just not looking at it the right way. I'm going to put the cap on and mark #1 wire on the body, line up rotor with that and give it a crank! ok, lets look at a real photo. here is the fsm book photo diagram/. only rotor, and slots aligned at mount matter. 96+ the distrib is clean slate new design with coil inside. and the gear is the hard part repeating so the rotor lands on #1 wire. then push the distributor in , so that I anticipate getting the mount to land in center. 1 in 13 is right, no others.. takes 2 or 3 tries, never 13.
the gear is spiral gears so is never straight drop in, you must backup a bit on the gear then drop it. only that gear is a pain, only it. Pointed the rotor to #1 spark lead and it fired right up. Seems perfect now but will dial it in properly with timing light this evening. Going to put a small layer of silicone around the base of the cap this time to try keep moisture and other fod out of it. Thanks for everything as always!